Bit of a diversion off the A-roads of rural Britain this week into an old mobile library van parked close to an urban A-road or two: the ROAM London project. 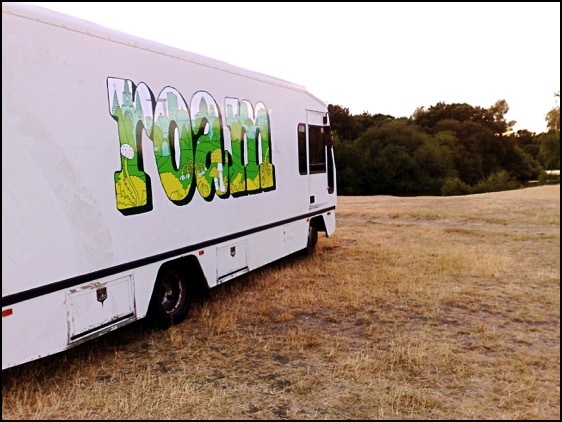 ROAM is touring the five Olympic boroughs of London over the next three weeks as a peripatetic arts space, a mobile reading room and a venue for talks and performance. It has its own reference library and comes complete with a proper parquet floor. It’s the idea of Caught By The River’s Robin Turner and fits well with that website’s general ethos of taking solace in easy, idle pursuits and looking for the rural within our urban lives. I’ve already had the pleasure of taking the message of the British Landscape Club there and chatting about the Britain beneath its wheels and I’ll be doing it again three more times over the next week and a half, so come and join me.